When we have to tell a patient that a root canal is needed, the message is not exactly met with enthusiasm most of the time. Patients typically have the misconception that root canal therapy is painful. While root canal remains an involved procedure, modern dentistry has given us the tools we need to ensure a painless experience. Sometimes bacteria find their way into the living pulp of a tooth. This is usually because of some kind of trauma or decay. A break or crack in tooth provides a possible entryway for bacteria. Extensive decay can also breach the enamel layer of the tooth, allowing bacteria to enter the pulp. When this happens, the trapped bacteria cause an infection within your tooth. When this happens, there are usually only two choices. Extract the tooth, or have a root canal performed. A dental filling will be placed and you may need to be fitted for a permanent crown. Because root canal therapy removes the nerves and blood vessels from the tooth, the tooth will no longer be maintained by your body’s systems. Though the tiny ligaments that hold the roots in place will be unaffected, you may need to protect the remaining tooth with a crown, especially if the tooth’s mass was affected by the decay or trauma. What a crown does is provide added structure and strength to the tooth to prevent future breakage. After your root canal therapy procedure is complete, we can talk about the need for a restorative crown. A crown is essentially a protective covering for the tooth. Porcelain crowns can be made that appear very much like real teeth. The light reflective properties are very similar to the tooth’s enamel. When you are ready to have your porcelain crown made, you will need to have the tooth prepared and have an impression mold taken of your mouth. A temporary crown may be placed in the meantime, while the permanent crown is being fabricated. After your crown is placed, it requires only the usual dental care, brushing, flossing, and regular trips to the dentist for cleanings and checkups. If you have dental pain, don’t delay! Call Buckhead Dental Partners at (404) 261-0610; we will provide pain relief and get to the root of your problem. 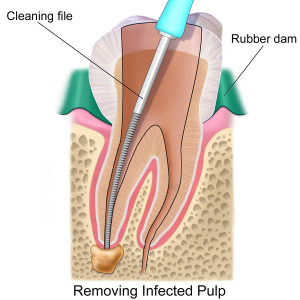 Root canal therapy can get rid of infection and pain, and can save your tooth. Let us help.